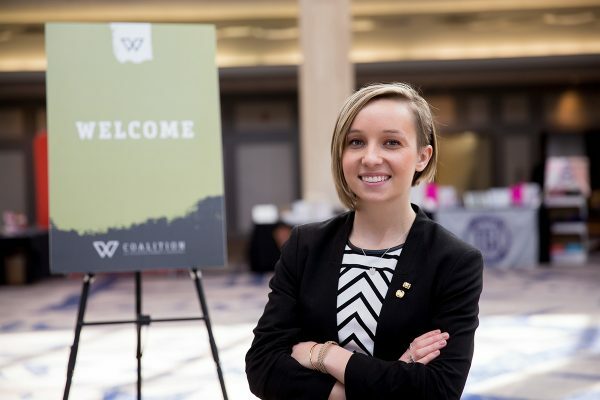 In 2017, when Erin Buttars (CWR ’18) assumed the presidency of the Panhellenic Council—the governing body of Case Western Reserve’s sorority system, and the largest women’s group on campus—she hadn’t yet declared sociology as her major. And she certainly didn’t know that her work with the council would provide the inspiration for her senior capstone, an independent research project required of all CWRU undergraduates. During Buttars’ tenure, the council entered into negotiations with the Intrafraternity Congress to form a unified governing body for sororities and fraternities alike. Although the two organizations represented nearly equal numbers of students, Buttars felt that she and her sorority sisters faced an uphill battle to secure equal voting rights—and often struggled to be heard at all. So she designed a multifaceted capstone to help women on campus gain greater confidence in their voices. Her project, “Our Story, Our Voice,” revolved around a three-day program of lectures, discussions and other activities that Buttars organized at CWRU last fall. By coincidence, the program opened on the same day—Oct. 15, 2017—that #MeToo emerged as a social media movement calling attention to sexual harassment. Events included a keynote address by Susan Hinze, associate professor in the Department of Sociology, and small-group discussions on topics such as the portrayal of women in the media. During one interactive session, Buttars spoke about her lack of confidence during the early days of her council presidency. Then she wrote down some of her fears (“not being good enough,” for example) on a wooden board and broke it in half. Others quickly did the same, to loud cheers and applause. The program culminated with a public event on the Mather Quad, where participants shared suggestions on how to confound gender stereotypes and promote women’s empowerment. With help from sociology department lecturer Karie Feldman (GRS ’10), Buttars designed a post-survey in which respondents assessed the program’s impact on them and indicated their level of agreement with statements on three themes: their confidence in their voices, their knowledge of the women’s movement and their sense of community and belonging. Buttars also asked the respondents how far along they were in their studies, what majors they were pursuing and whether they had a strong female role model. Overall, respondents testified to the program’s positive impact. Yet Buttars found that students majoring in STEM fields showed lower favorable response rates across all three survey areas and were less likely than humanities or social science students to have a female role model. These findings were consistent with those of other researchers, who have identified a variety of challenges faced specifically by women seeking STEM degrees. Buttars presented her research at the annual meeting of the Coalition for Collegiate Women’s Leadership in Atlanta this spring. She also distributed the materials she had developed for her three-day program in hopes that others might replicate it on their campuses. 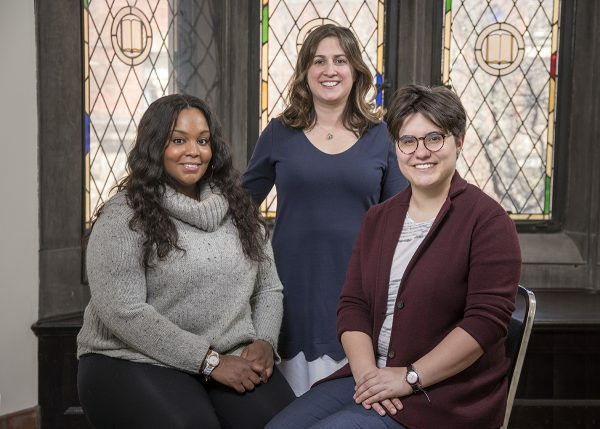 The desire to achieve positive social change is one of many threads uniting sociology research projects that Buttars and three other students pursued as members of a Senior Capstone Experience seminar that Feldman led last fall. Once their projects were completed, they disseminated their findings both at university forums and at national and regional conferences. “We try to give them an opportunity to feel not just like students, but like professionals who can contribute to the field,” Feldman says. Tori Hamilton (CWR ’18), a double major in sociology and women’s and gender studies, draws her inspiration from promoting social justice. A sociology course on racial inequality and criminal justice in the United States, taught by Associate Professor Timothy Black, opened Hamilton’s eyes to the problem of mass incarceration. When Hamilton told Feldman that she wanted to pursue a legal career working with people who were either in prison or trying to stay out of it, Feldman suggested that she use her capstone to examine initiatives that help inmates reintegrate into society. Hamilton interviewed staff members at two local prisoner reentry programs that offer culinary training. EDWINS Leadership & Restaurant Institute, founded by social entrepreneur Brandon Chrostowski, runs an upscale French restaurant where former inmates learn to be chefs and acquire customer service and management skills. Chopping for Change, a program developed by Lutheran Metropolitan Ministry, works with incarcerated women who are about to be released; participants obtain training and experience at the ministry’s commercial kitchen, where they help make meals for homeless shelters. Hamilton also interviewed an employment lawyer and a manager at Pier W, a restaurant in Lakewood, Ohio, that hires graduates from both programs. Hamilton concluded that small, community-based programs like EDWINS and Chopping for Change can be highly effective. Recidivism rates for graduates are low, while employment rates are high; 95 percent of EDWINS alumni, for example, find jobs, and some even open their own restaurants. In addition, such programs provide mentoring and other services that may not be available through larger, state-run initiatives. They also face challenges. While employers are generally eager to hire well-trained kitchen staff, they can be leery of applicants who have committed violent crimes or other felonies. And current inmates with felony convictions may not be allowed to participate in a program like Chopping for Change, which operates outside the prison. Hamilton, who presented her capstone at the annual conference of the Association for Applied and Clinical Sociology in Cleveland, believes that overcoming these obstacles will require lowering institutional barriers. 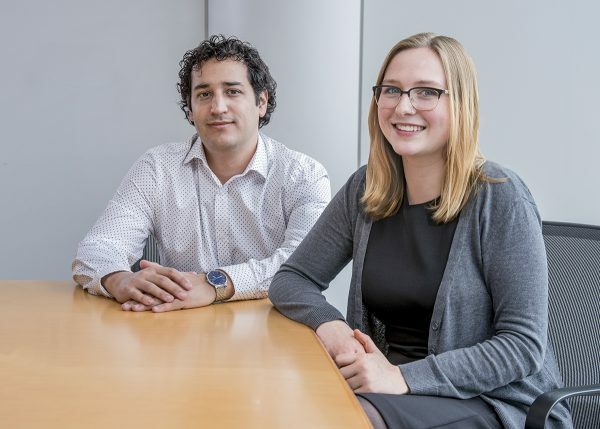 Toward this end, she did an independent study with Black this spring, exploring how states can reclassify felonies in order to reduce prison populations. She also helped collect signatures for a statewide ballot initiative in Ohio that would downgrade lesser drug offenses from felonies to misdemeanors. “I have the opportunity to take the energy and the ideas that I got from my research and apply them right now,” she says, echoing the sense of urgency that Buttars feels regarding her own scholarship. Two other students in Feldman’s seminar turned a sociological lens on the issue of drug abuse, but they took very different approaches. Sarah Jammal’s project was animated by her interest in urban planning and public health. Sharmayne Schaffer (CWR ’18) chose a project that reflected her passion for analyzing social phenomena in terms of race, class and gender. Jammal hails from Ohio’s Ashtabula County, which has been devastated by the opioid epidemic, and she knows people who have struggled with addiction. For her capstone, she used geographic information system (GIS) software to map the locations of opioid overdoses in Ashtabula and Cuyahoga counties. With support from the Freedman Center for Digital Scholarship at Kelvin Smith Library, Jammal sifted data provided by the Cuyahoga County Medical Examiner’s office and the Ashtabula County Drug Enforcement Agency. She pinpointed the sites of overdoses, determined whether these sites were public or private places and enriched the resulting map with additional information: average household income by census block, for example, and distance from victims’ homes to their overdose sites. Jammal also interviewed people on the front lines of the epidemic: an Emergency Medical Services chief, a city manager and even a library director, since opioid addicts have been known to shoot up in library bathrooms. Jammal’s goal was to identify locational patterns of drug use that could be used to target interventions. “The thing is,” she says, “I didn’t find any.” Yet that in itself was revealing, as she explained when she presented her results at the annual meeting of the North Central Sociological Association in April. Previous drug scourges were associated with specific locales, like the notorious shooting galleries of the crack cocaine epidemic. Opioids, however, are abused by a broad range of societal groups in all manner of spaces. And that capacity to infiltrate virtually every nook and cranny of American society, Jammal says, may help explain why this public health crisis has proven to be so intractable. Schaffer, who started out majoring in women’s and gender studies and then added sociology, came to the university through the Cleveland Humanities Collaborative, which offers graduates of Cuyahoga Community College a pathway to earning a bachelor’s degree in the humanities at CWRU. She traces the origins of her project to a classroom discussion about media portrayals of black women during the crack epidemic in the 1980s. “I’m a woman of color, so I love explaining anything that has to do with black women,” she says. During a subsequent discussion in the weekly capstone seminar, Jammal mentioned her research on opioid overdoses, and a lightbulb went off in Schaffer’s mind. She decided to compare journalistic accounts of the crack epidemic with accounts of the opioid epidemic, focusing on depictions of addicted expectant mothers. Schaffer wanted to find out whether black women on crack were portrayed more negatively than white women on opioids. Relying both on her own archival research and on an earlier study of the crack epidemic, Schaffer scoured scores of newspaper articles for language that indicated pregnant drug-using women were scapegoated for social problems such as crime and delinquency; portrayed as bad parents who neither loved nor cared for their kids; or blamed for imposing a burden on the adoption, foster care or healthcare systems. She also sorted the women in the articles by race, class and drug used. The results, which she presented to the campus community last December during the Capstone Fair, surprised her. Schaffer expected black women to be portrayed as bad mothers far more often than their white counterparts. In fact, the gap was fairly narrow, with 83 percent of crack-related articles and 75 percent of opioid-related articles depicting drug-abusing pregnant women as bad moms. “Women in general are just depicted as bad mothers, regardless of which drug they use,” says Schaffer. These negative portrayals matter, she adds, because they influence both societal perceptions of women and social policies—policies that can have a detrimental effect on poor women and their families. During her last semester as an undergraduate, Schaffer did an independent study with Feldman, delving further into her capstone topic. She now hopes to earn a graduate degree in nonprofit management at CWRU and eventually start a community nonprofit dedicated to empowering black women. As is typical for sociology capstones, each one of these projects evolved organically out of students’ own passions and interests. And that was no accident: As Hinze explains, she and her colleagues begin by asking students what they are most curious about, and actively encourage them to identify and pursue original research topics. There are practical benefits to structuring the capstone experience this way, Feldman says. “Students are going to do their best work if they research what truly inspires them,” she explains. And this work, she hopes, will prove valuable both to their discipline and to the larger society.